Dean Butler with Legacy Documentaries has taken the much loved book Farmer Boy by Laura Ingalls Wilder, and documented the times and life of Almanzo Wilder while he lived in Burke NY as a young boy. Dean played Almanzo in the much loved television series Little House on the Prairie from 1979-1983. 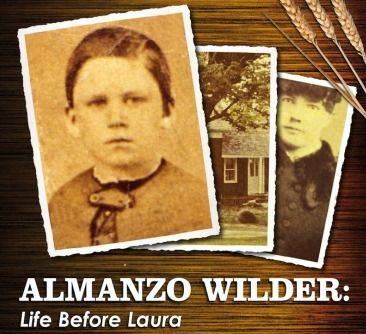 He hosts and narrates the documentary Almanzo Wilder: Life Before Laura. The target audience for this film is age 8-13, or those similar to the age where they would be interested in reading the books. I would recommend reading Farmer Boy first, then watching the show. I think it will really bring the story to life for yourself and your child! We didn't do that, but will be reading the second book in Laura Ingalls Wilder's series Farmer Boy this fall and will re-watch the show after that. Life Before Laura shares not only the life of Almanzo when he was a young boy, but shares the history, the family structure, and much of the differences of the time frame from the mid 1800's. Using real life photos of Almanzo's family archives, photos of the town, video footage as well as reenacted scenes, the story of the "Time where America was innocent", really speaks to children and adults today. During this period of history only one in twenty people lives in the city. Farming was the norm, as was discipline of children, family unity and the value of hard work. "The family was the prime structure these people interacted with". This look at the life of Almanzo draws the viewer in to a time when things weren't as bogged down as they are today. I loved the scene where it visually shows the appliances and gadgets that the family did without in the 1800's. I think for my little ones, they have no concept of life without a refrigerator, or microwave, let alone a car. This visual was very good to show them the realty of life back in the day. The theme of working hard for your money is a great one throughout the life of Almanzo. I think it motivated him throughout his life to strive to succeed. He met Laura who was 10 year his junior when they had moved west to DeSmet South Dakota. We learn of the foods, Sunday Sabbath, the Morgan Horse and more during this time in Almanzo's childhood. The show runs 40 minutes and sells for $21.95. There is a second title on the disc Wilder Homestead Today which is a 12 minute look at the Wilder Homestead and the buildings there now. The barns have all been reconstructed on their original foundation. The house is the original with some repairs of course. The home is decorated with carefully selected items from the time period. This video made me want to travel to Burke New York! Excellent documentary to go along with a study of the Westward Movement, Prairie Life, or a unit study on the Little House on the Prairie series! See what my Fellow Crew Members thought of this show by clicking the banner below.